One of my goals is to weave digital tools into the Common Core to design flexible, student driven learning experiences that are Above the Line as defined by the SAMR model. While this might sound like a mouthful of EdTech, I assure you that combining all that is on our crowded plates is far better than tackling each individual initiative in isolation. This idea is supported by the Partnership for 21st Century Skills. The Common Core defines what students should be able to do. Digital tools provide students with resources, flexible options and support to do it. 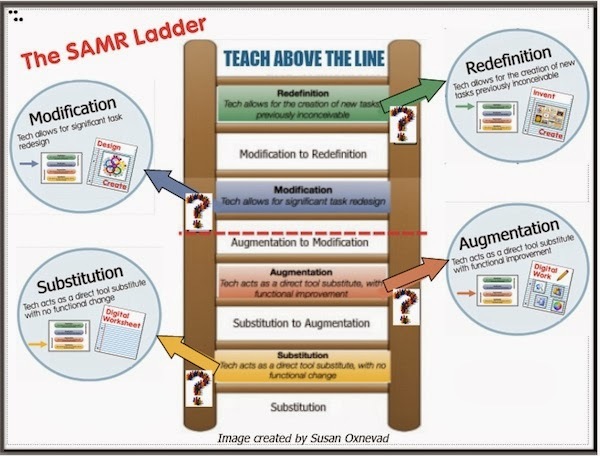 The SAMR model provides teachers with a point of reference to reflect on what they are asking students to do and challenges them to embrace technology to design learning experiences that allow students to do what couldn’t be done without the tech. This digital toolkit is filled with resources for compacting that crowded plate and embracing technology as a tool to fuel deep learning. It can be used as a launching pad to shift instructional practices that target the CCSS through active student participation, providing them with opportunities to engage in the 4C’s. Explore it and dive in, one step at a time. Are you looking for ways to leverage the power of technology to help students develop 21st Century Skills? 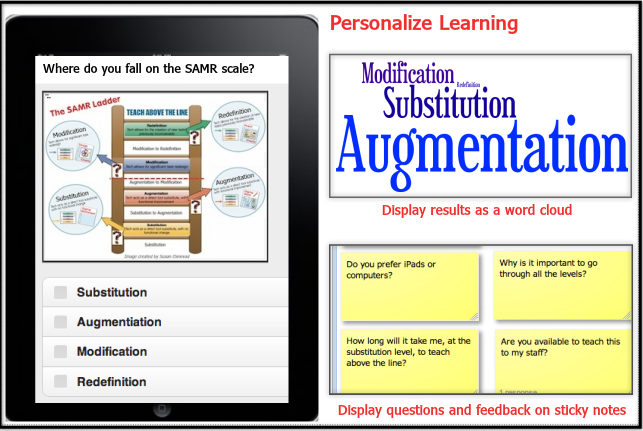 Researchers have determined that technology integration typically moves through four specific levels: Substitution, Augmentation, Modification, and Redefinition (SAMR).The higher the level of an activity the greater the educational benefit. 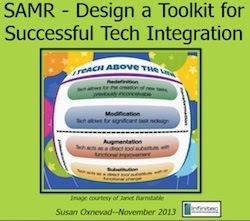 This webinar will demonstrate how to use the SAMR model of technology integration as a guide for planning and implementing classroom learning experiences that take student learning to higher levels. mQlicker is an audience response system that that allows users to turn a PowerPoint into an interactive slideshow to engage audiences and collect useful feedback. mQlicker is free, flexible and definitely worth checking out for use in a variety of educational settings. This cool tool has a lot of potential for collecting feedback and fine-tuning instruction. mQlicker is a useful tool that allows presenters to engage audiences in the classroom, during professional development or via online presentations. The response system works with any web capable device, and there is enhanced support for iPhone, iPad, Android and Blackberry devices. From an audience participant perspective, mQlicker couldn’t be easier to use. Members of any size audience can access questions through a link, or they can quickly scan an auto-generated QR code. Audience members identities are anonymous and their connection is secure. From a presenter’s perspective, mQlicker goes beyond traditional audience polling options to collect many different types of useful information. Presenters can collect and display responses to traditional types of questions through polls and surveys that are displayed in real-time, and they can utilize some flexible options for collecting free response feedback. mQlicker allows presenters to do more than just check the pulse of their audience. There are several options for creating different types of questions to engage audiences. In addition to traditional text based polls and surveys, presenters can embed YouTube video and images into a question, providing audiences with rich content. For use as a quick quiz, multiple choice answers options can be shuffled to avoid sharing of answers. Several questions can be grouped on one page. 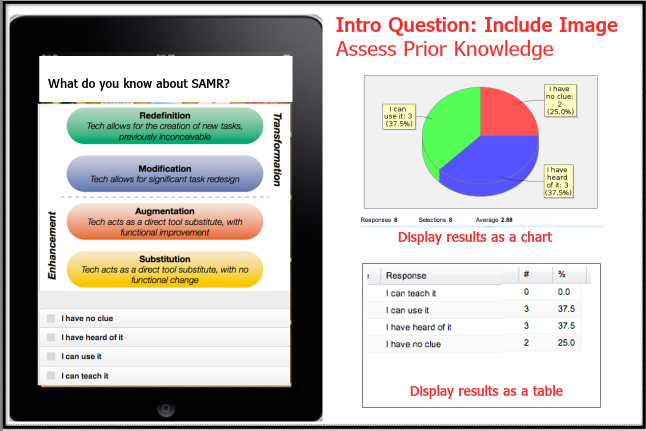 mClicker includes the ability to capture feedback and display results in unique ways. In addition to traditional option, such as bar charts and pie charts, mQlicker provides the option of displaying results in the form of sticky notes and word clouds to provide interesting visual results. Participants can use a link to view real time results in full screen or they can view them embedded into the presentation itself. Presenters can export results and download them as a spreadsheet for evaluation and insight. The flexibility offered by mQlicker makes it a useful tool for a variety of purposes. There is no limit to the number of responses collected and multiple sessions can be created and open at the same time, a feature especially useful for teachers who teach more than one section of a class. Once you try mQlicker for yourself, I’m sure you will find it to be well-suited for a variety of purposes to help your audience tune in and to help you fine tune instruction. Here are a few ideas to get you started. Turn a traditional presentation based lecture into an interactive session to give students a voice. Start with a video to provide students with a common starting point for instruction and provide them with an open-ended question that allows them to type questions and comments throughout the lecture. Display the Questions and Comments as sticky notes in real-time. Divide longer lectures into sections and create Exit Polls throughout the lesson to gauge understanding. Create an online presentation and assign it to students as homework to prepare them for work in class. Use mQlicker to collect feedback and monitor use, then use the results to inform and fine tune the instruction and activities students participate in when they return to class. Get the most out of professional development and demonstrate your own expertise by gauging the level of knowledge and interest of your audience. Use video and questions to launch collaborative group work and brainstorming sessions and use results collected to give the audience what they came for. As someone who frequently presents to students and adult educators through a variety of formats, I am excited to add mQlicker to my toolkit of resources. I have used it successfully with a few small audiences and intend to use mQlicker in the next few weeks during a webinar and also a break out session at a conference. I believe the tool will allow me to capture those teachable moments and make the most of the time we have together. Are you looking for ways to effectively implement and manage the Common Core aligned classroom? The CCSS identify a spiraling set of skills necessary to prepare students for success. The standards are designed to teach students how to think. They call for increased comprehension, synthesis of information and the ability to clearly express learning. To facilitate the deep learning experiences supported by the CCSS, a shift in instructional practices is necessary. 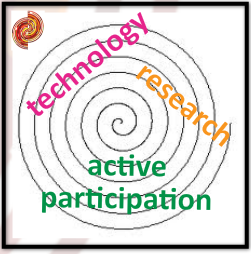 The seamless integration of technology into the Common Core aligned curriculum supports learning through active participation and increases opportunities for all students to have access to the resources and information they need for success. With increasing numbers of Internet connected portable learning devices in our schools, access to information is readily available in a variety of formats and often in the palm of our students’ hands. While it’s safe to say that many schools are wired, it’s time to combine digital tools with innovative instructional practices to get our students plugged in. Instead of teaching scripted curriculum defined by a textbook, consider putting your teaching skills and expertise to good use during the instructional planning phase by using essential questions to fuel the learning. Essential questions require students to construct knowledge and when combined with a flexible lesson design this type of learning can allow students to express learning in original ways. There is no room for answers that simply require copying and pasting, and worksheets become obsolete. Explore my toolkit of resources for helping students uncover knowledge and create something original. Technology is a powerful tool for learning that can be used effectively to help students develop the skills necessary to succeed in school and beyond. Students can develop transferrable knowledge and skills as they engage in learning experiences that require them to construct knowledge. The Common Core presents new challenges and new opportunities to help us focus on deep learning. This requires shifts in instructional practices. We have the opportunity to redesign learning, let’s embrace it! I’m hosting a webinar onTuesday, 11/19 at 4:00 PM EST to explore Instructional Shifts to Support the Common Core. If you are a Simple K-12 member, I hope you will join us for a closer look at the ideas presented here. 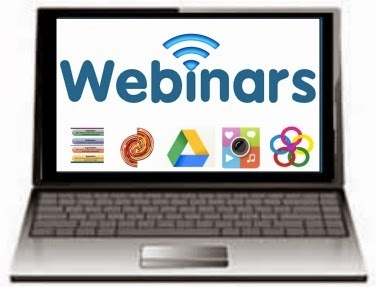 On Saturday, November 16th, Simple K12 will be hosting a full day of free webinars on Google Tools for Teachers. I’m excited to be presenting webinars at 2:00 and 3:00 PM EST and I’m looking forward to learning from a talented lineup of SK12 presenters! As an instructional technology facilitator my goal is to weave together digital tools to design engaging, interactive learning experiences that support all learners and encourage higher order thinking. Of course, in order to be useful for teachers, these learning experiences need to be aligned to standards, initiatives and hot edtech topics. ThingLink is one of the most frequently used tools in my digital toolkit because it is flexible, user friendly, and it can be used to help me meet my goals. I believe ThingLink allows me to create whatever I can possibly imagine! ThingLink, an online tool that provides users with the ability to turn any image into a multimedia rich interactive graphic. Add video, images, audio, and links to any website with the click of a button. Pack a lot of content into a small space and embed it into a variety of online learning platforms for easy access, 24/7. ThingLink is user friendly flexible and free. In preparation for my Simple K12 webinar this week, I put together this interactive image to illustrate some effective ideas for using ThingLink. Please explore this image. This blog is filled with examples and ideas for using ThingLink for teaching and learning. In addition to a few dedicated posts you will find that ThingLink is woven into many different ideas and examples I have shared. 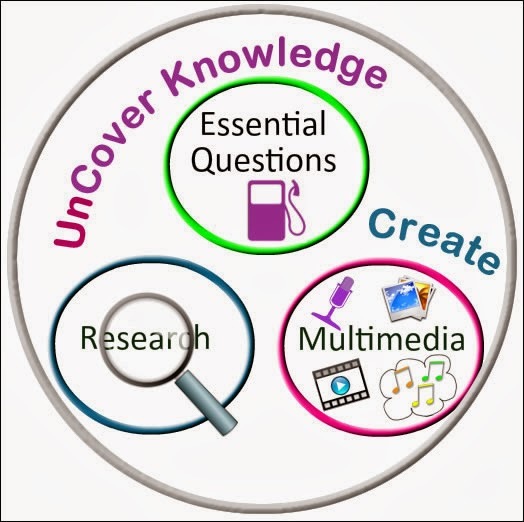 Beyond that, please visit my ThingLink Toolkit. The toolkit is a comprehensive collection of resources to help teachers and students successfully use ThingLink for teaching and learning. There you will find many examples and quite a few tutorials to get you started. If you are a Simple K12 member, I invite you to attend the webinar I am hosting on Tuesday, November 12th for 30 minutes of learning, live and worldwide! I enjoyed presenting the Infinitec webinar today and truly appreciate all the attendees! Here is a link to the interactive slideshow with resources. The final webinar in this series will be held on December 3rd at 4:00 PM CST. 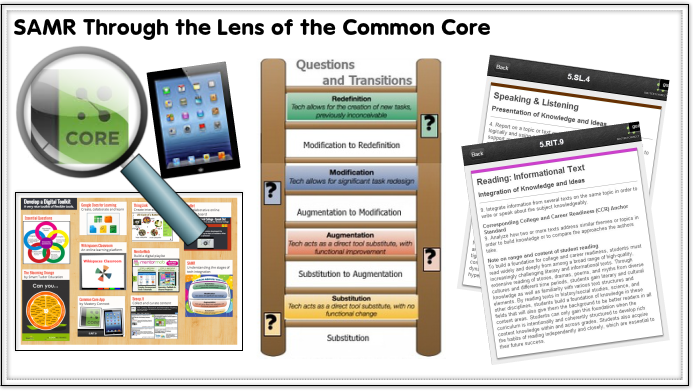 SAMR Through the Lens of the Common Core. The webinar is free and registration is open to all.